One of the features in my first few designs is the option to make a cutwork edge as part of the embroidery process, creating a neatly finished edge like you find in hand sewn and manufactured goods. Since this may not be familiar to many of you, I wanted to post a quick tutorial as well as a freebie so you can try it out at home. Whenever possible, I use natural fiber fabrics as my base for embroidery. Fine fabrics such as lightweight lawn and batiste are suitable for cutwork, but anything extremely sheer and delicate may not have enough body to support the cut edge once the stabilizer is rinsed away. If you wish to use a very sheer fabric, I recommend that you experiment with a combination of stabilizers, possibly using a tear away under the cutwork edge for additional support even if you use wash away stabilizer for the rest of the design. 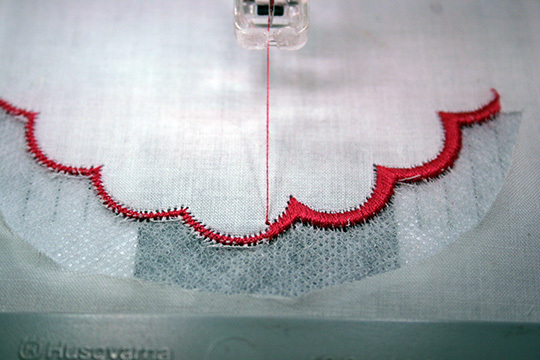 For cutwork designs I use matching thread on top and in the bobbin, rather than a different bobbin thread. 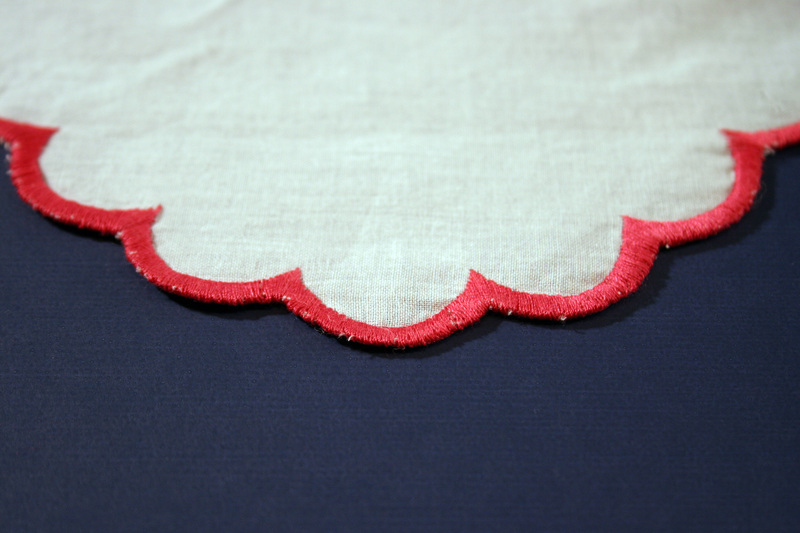 This creates a smooth finished edge for the fabric. I typically use DMC 50 weight cotton machine embroidery thread, and sometimes an 80 weight thread like Madeira Cotona for delicate fabrics. 1. Lightly starch and iron your fabric before beginning. 2. If making a continuous border, mark a line for your finished edge with a pencil, wash away pen, or by drawing a single thread. This will be where the deepest part of the scallop touches the edge. You may also wish to mark a second line marking the highest point of the scallops, where the design repeats match up. 3. Layer the fabric on top of 1-2 layers of wash-away stabilizer. If desired, use a temporary spray adhesive to hold the layers together while hooping. Hoop with the fabric layer on top. 4. Stitch Color 1, which forms a cutting line in running stitch, just inside the finished edge of the design. Color 1 stitches out the cutting line. 5. Remove hoop from the machine, but DO NOT remove the fabric from the hoop. 6. 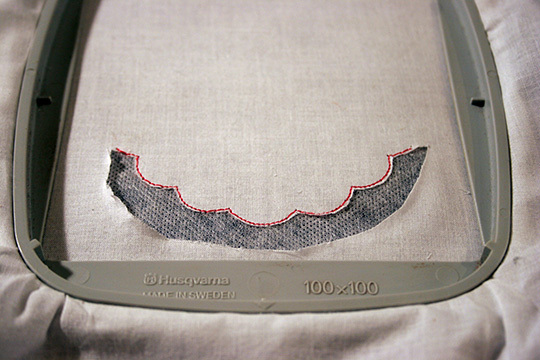 Carefully trim away the fabric below the stitched line, cutting as close as possible to the stitching without cutting any threads. Be careful not to stretch or shift the fabric while trimming. 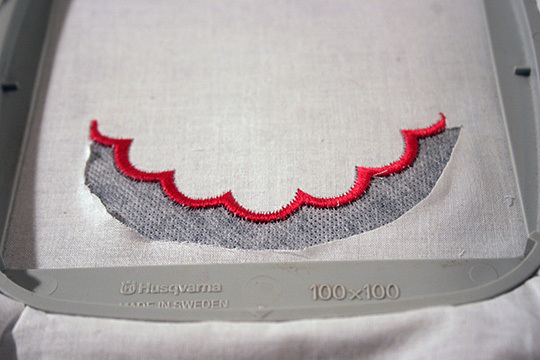 I also trim away the loose fabric so it can’t get caught in the stitching later. Do not cut into the layer of stabilizer. Trim away excess fabric below cutting line. 7. Replace the hoop in the machine, and continue stitching the remaining colors of the design. Color 2 will zigzag over the cut edge of the fabric, then cover it in satin stitches. When the stabilizer is washed away, this will be the finished edge of the fabric. 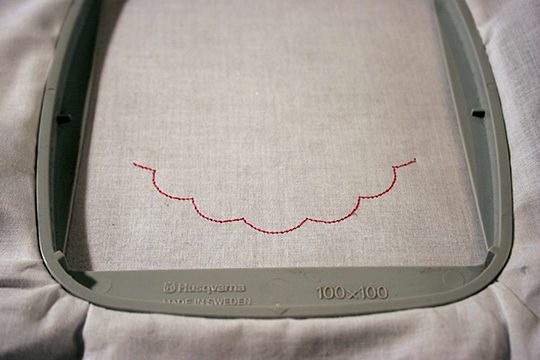 If you notice you have a lot of whiskers showing after the zigzag stitches, you can stop the machine and trim them away before you stitch the satin stitches. Most of the time they won’t be noticeable in the finished project. Halfway through color 1, showing the zigzag stitches being covered by satin stitches. Satin stitches completed. Ready to repeat into a border, or to wash away the stabilizer. Here are the front and back views of the finished stitching. The back stitches don’t look as smooth as the top stitches, but when stitched in matching thread they won’t be noticeably different looking if the edge gets flipped up during use. 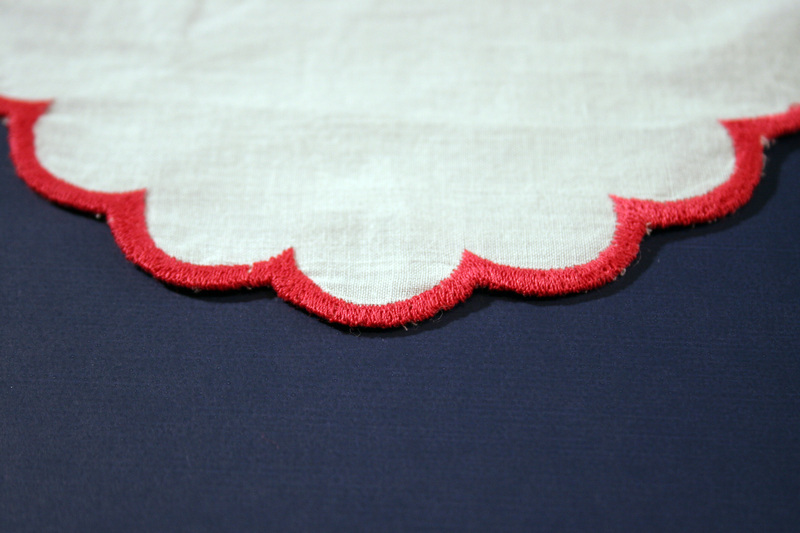 Just think of all the things you can do with a pretty scalloped border. Here is my Pinterest board with a few ideas to get you started. Want to try it out? Download the freebie here. I tried to get the download and it said it wasn’t available. Hi Byron, sorry you had some trouble with the download. I think the message you’re seeing is the one that says “sorry, the preview is not available” because the download site can’t preview an image of embroidery files the same way it can preview photos or PDFs. But there is a download button below that for you to get the design. Thanks! Byron, I just realized why you had trouble downloading – this is an old website that should be redirecting to my current one. Hi Denise! Sorry about that! I actually moved the blog to a new website a few years ago, and this page *should* have redirected you there.